In late March the Town of Peace River added the flags of the Treaty 8 First Nations and the Métis Nation to Town Council chambers later. The moment was commemorated with a pipe ceremony. Thank you to everyone who took part in the Pipe Ceremony including: Leonard Cardinal – Pipe Carrier, Thunderbird Inc; Amanda Ferguson, Thunderbird Inc; Chief Issac Laboucan- Avirom – Woodland Cree First Nation; Hannah Laboucan-Avirom, youth Woodland Cree First Nation; Barry Nooskey – President Cadotte Lake Métis Local; Councillor Woodland Cree First Nation – George Merrier; Dennis Whitford – Elder, Peace River; Ruby Auger – Elder, Woodland Cree First Nation; Lillian Whitehead – Elder, Lubicon Lake Band; Nora Laboucan – Elder, Lubicon Lake Band; Driftpile Drummers – Bernard Colman JR, Coltan Bellerose, Georgie Isadore, Mehkwa Bellerose, Mikisew Bellerose, Sohkies Bellerose, Willy Isadore; Georgie Isadore – Elder Driftpile First Nation; Michelle Hulley – MLA Debbie Jabour’s office representative; Marcella Carifelle – Elder, Cadotte Lake Métis Local; Mayor Thomas Tarpey; Councillor Johanna Downing; Councillor Elaine Manzer; Laura Love – Curator Peace River Museum; JC Erasmus – Town of Peace River; Tanya Bell – Director of Community Services; Wendy Goulet- Peace River Aboriginal Interagency Committee; Greg Towne, Director of Corporate Services. The installation of these flags was the result of our partnership with the Peace River Aboriginal Interagency on the development of an Indigenous Outreach Strategy that addresses the National Truth and Reconciliation Committee recommendations. In addition to installing the flags in Council Chambers, the committee has also recommended that the Town install the Treaty 8 and Métis flags along with the Canadian, Albertan, and Peace River flags in a public location in the community. 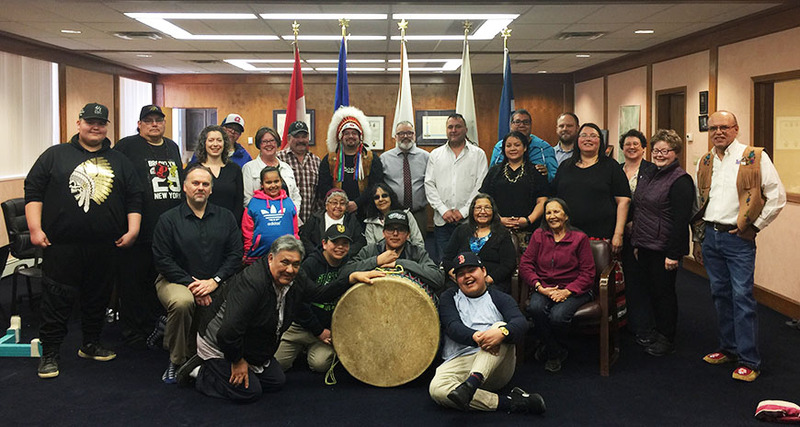 These recommendations came as the result of consultations with Indigenous Elders from the community and region, the committee heard of the importance to recognize the involvement of our Indigenous peoples to the development of our community. Raising the flags of both Treaty 8 and Métis Nations is an opportunity to engage the community towards recognition and reconciliation. The flags will be located near Riverfront Park and the Third Mission, they will be raised for the first time on June 21.